They are lightweight and portable so they can easily be moved from place to place. Yet they are heavy enough to be durable and support a small to medium parrot landing on them at speed. Some of mine I keep in a permanent location so the parrots know where they are and can fly there for safety (or toilet). The other stands I move around depending on what I am training. Typically I keep the height a bit below my head but sometimes I raise them for video or special training. If I'd like to sit in a chair, I can bring the training stands down to remain at a convenient height for training. Parrot training perches eliminate the distraction that colorful play gyms and multi-branched climbing trees can create, keeping your parrot's attention on you for training. Since the two stands are independent, the ways you can line them up are numerous. Set them up parallel to each other to teach the parrot to fly between the two stands. Set the perches up perpendicular to each other to keep two parrots on them but not fight with each other. It is easy to add a newspaper at the base to collect any mess. 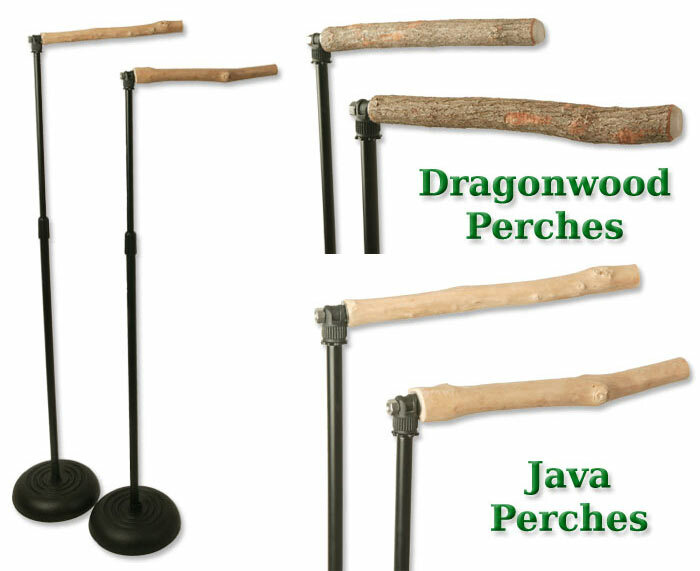 Visit www.TrainingPerch.com to order a set of stands for training your parrot. I was so excited about these that I place my order and didn't read that you said to mention my user name in the comments on the order. Will you be able to watch for my order so that I can take you up on your special "extras?" I am so glad that you were able to get these into production and that they are now available to your loyal fans! I can't wait to get mine and get things moving here with the training. WOOHOO! Got the training perches today. Sammy, one of my Senegals, quickly claimed them as his. Of course they had to pass the taste test first. Michael, these perches are very high quality, not to mention a great design. They will last for years, and years. I love them! Now, we have to get busy training! LOL...that's the cutest product testimonial I've ever seen! I love the picture. Looks just like Kili on her stand. 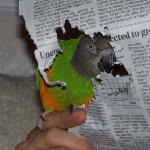 Don't worry, Sammy will strip that stand free of bark in no time BTW you need not worry about the parrot biting on the hardware at all. I probably didn't make a big deal about this but I went all out and got stainless steel nuts and washers. The bird might try to chew on it a few times but eventually will get bored and give up. I do remember that you posted somewhere that those parts were made of stainless steel. You're right about him giving up on mouthing the hardware. He was just curious, as they all are. Once he "tasted" everything then he was content to sit on it and just look around. Wait 'til he finds out that he now has a job to do while sitting up there.